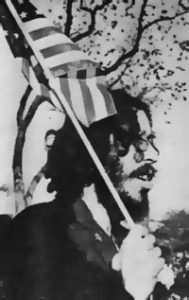 On January 22, St. Ann’s Warehouse will be hosting a benefit concert to help pay medical expenses for Tuli Kupferberg, the lifelong anarchist, anti-war poet and all around wiseass who co-founded local heroes the Fugs. Kupferberg suffered two strokes, in April and September 2009, which left him blind, confined to his apartment and in need of 24-hour care. He is recovering well and is able to speak clearly, but has overwhelming medical expenses not covered by Medicare or the very modest publishing/royalties income he earns at the age of 86. Whether because of their political activism (Kupferberg was arrested trying to levitate the Pentagon, which earned him a spot in Norman Mailer’s Pulitzer Prize-winning The Armies of the Night), or because of top 40-unfriendly songs like “Coca-Cola Douche”, the Fugs didn’t spend a lot of time on Ed Sullivan. They were a huge influence on what later became indie music, as well as the work of icons Frank Zappa and the Velvet Underground.